A lot of people are aware of the Triennial that takes place in Folkestone every three years, the first one being back in 2008, and yet there are a lot who do not. The Folkestone Triennial is a free exhibition available to view every day from 10.30am until 5pm right up to the 25th September. It is a chance to see new commissions from 19 international artists. The artwork includes sculpture, film, sound works and installations and are located throughout Folkestone's streets, beaches, historic buildings and squares. The event has been curated by Andrea Schlieker and this year’s theme is “A Million Miles from Home”. Referring to the sense of being between worlds, of displacement, separation, transience and having to find bearings in an unknown elsewhere. The event brings in a huge amount of interest both locally and from further afield. 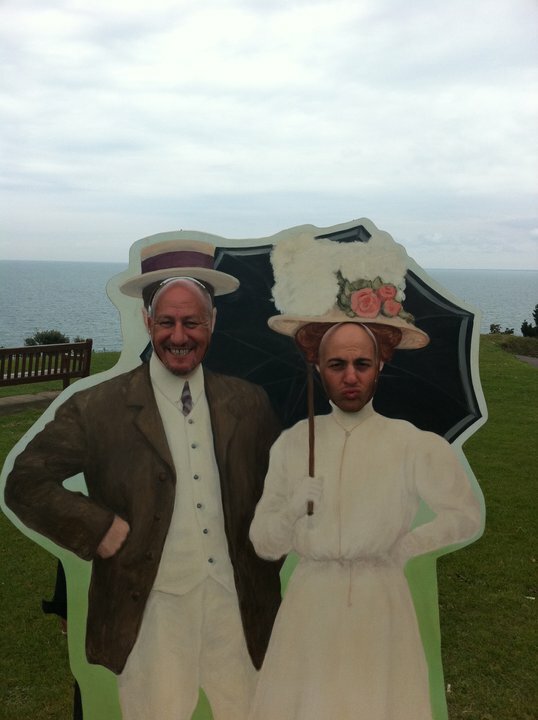 Being a Hotel located on the Leas in Folkestone, with the walk bringing many visitors right passed our door, we thought we would take a stroll with a guide and see the exhibition for ourselves. To be able to better help those who are staying with us and need to ask questions or indeed just discuss the exhibition with us as they pass through. We saw so much, that I couldn't possibly tell you about it all in this blog, so I will simply pick out the 4 works that stand out in my memory the most! Our first stop was the Martello Tower 4. A work by Cristina Iglesias called “Towards the Sound of Wilderness”. This architectural intervention on the ramparts of Martello 4 gives the illusion of an entrance to another world. For me it could almost have been the entrance through to Narnia, just like in the CJ Lewis classic “The Lion, The Witch & The Wardrobe”. 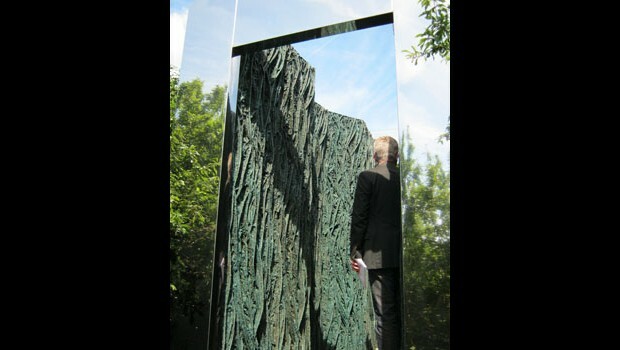 The sculpture allows you to see this historic monument for the first time in years. To get to it....simply negotiate a path cut into the shrubs and trees to a mirrored walk in a structure clad with resin foliage. A window at the end of this passageway opens up a view of the over grown tower and moat with its extraordinary wildlife. Just standing there looking at the view you could be anywhere in the world. The sound of the sea seemed very loud and quite strange as you cannot see it, yet there is something very calming about knowing it is there. The next stop was to take a look at a clock. Pretty normal on first inspection and I wouldn't have thought any more about it, until I spotted when looking closer it had 2 sides. One, a standard 12 hour clock, the other, a 10 hour clock! There are 10 of these dotted around Folkestone in various locations. They represent a time in history when on the 5th August 1793, the recently formed Republic of France abandoned the Georgian Calendar in favour of an entirely new model, the French Republican Calendar. This became the official calendar of France for 13 years. Each day of the Republican Calendar was made up of 10 hours. Hours were divided into 100 minutes and each minute into 100 seconds. 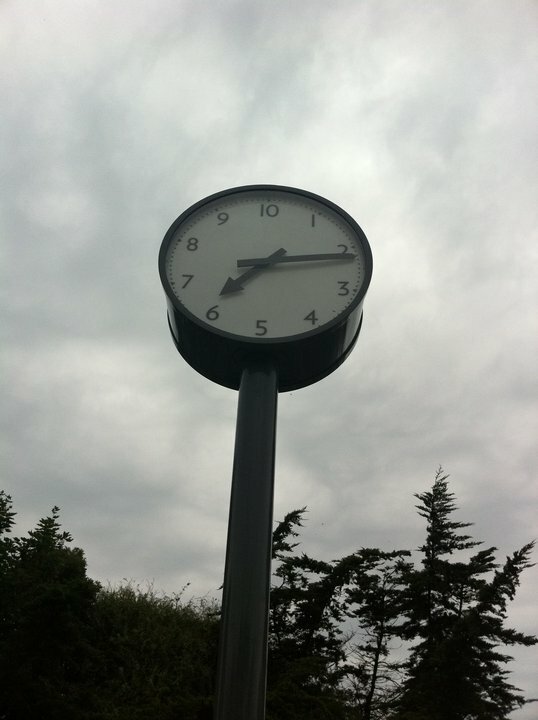 Ruth Ewan, inspired by this has created new clocks, and altered existing ones around the town to display decimal time. It took me a while to get my head around it, and then I spent some more time trying to work it all out and checking they told the right time! I also wondered if a 10 hour clock would mean I would only have to work 6 hour days. Wouldn't it be nice! We walked further into Folkestone, down into the Town Centre passing various other works and clocks and were taken into Albion House, located above Boots. Smada Dreyfus from Israel has created a piece of art called “School”. As we entered the building and walked up the stairs, we were informed it's very dark inside but to go carefully and find the lessons we would like to join in. The options were History, Citizenship, Geography, Arabic, Bible studies, Biology and Literature. Dark was an understatement, it was pitch black! We couldn't see a thing, only hear talking, and eventually, once finding our way into a classroom, we could see the translation of what we were hearing on a black screen in front of us. A very intense Biology lesson I felt. Due to the darkness you could do nothing else but focus on what you heard and read on the screen, well worth the experience. Certainly to a few of us also a new way of viewing art! The last stop we went on really does stick in my mind and is perhaps my favourite of all. It is a display by Hew Locke titled “For Those In Peril On The Sea”. 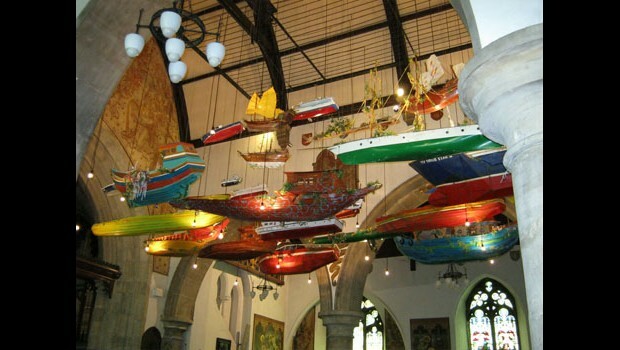 An amazing installation that hangs from the ceiling of the oldest building in Folkestone, St Mary & St Eanswythe's Church. Consisting of around 100 model ships, from warships, trawlers, steamers, liners to brigs, rafts and junks that have been collected from around the world as well as made in Lockes' own studio out of cardboard. Such a beautiful church with such a fantastic display, really did take my breath away. If you have not yet collected your guide and been for a walk to see some of these pieces of art for yourself, do not delay. They won’t all be here forever, and really are something to be seen. Even if you don't count yourself as an art lover, I am sure you will find at least two items that you can connect to. The beauty of art, we all see it in different ways and make our own interpretations. This is an exhibition where there is definitely something for everyone. The Guest Who Never Checked Out.